The Best Association Website of 2019 will be named as part of their 23rd annual international WebAward Competition for Web site development at the WebAward Web site. The WebAwards is the standards-defining competition that sets benchmarks for 96 industries, including association websites, based on the seven criteria of a successful Web site. The deadline for association web sites to enter to be judged is May 31, 2019. Boston, MA, April 02, 2019 --(PR.com)-- The Web Marketing Association is looking for the best association Websites in the world as part of their 23rd annual international WebAward Competition for Web site development at the WebAward Web site. 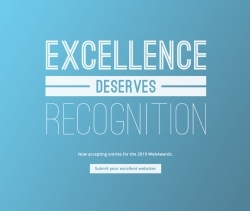 The WebAwards is the standards-defining competition that sets benchmarks for 96 industries, including association websites, based on the seven criteria of a successful Web site. The deadline for advertising web sites to enter to be judged is May 31, 2019. Web sites are judged on seven criteria including design, innovation, content, technology, interactivity, copy writing and ease of use. Each WebAward entry in the association category is judged against other association entries in its industry category and then against an overall standard of excellence. All association entrants benefit from receiving valuable feedback in terms of their specific scores compared against the average scores for their industry. They also may receive specific comments from the WebAward’s professional judging panel on their Web site development efforts. · A highlight for your resume. The 2019 WebAwards are sponsored by the following leading organizations: PR.com, EContent Magazine, iContact, and Webmaster Radio. The Web Marketing Association thanks these companies for their commitment to the entire online marketing community. The Web Marketing Association was founded in 1997 to help define the standard of excellence for online marketing. Our internationally known award programs, such as WebAward Competition for Website Development, Internet Advertising Competition and the MobileWebAwards, recognize the people and organizations responsible for developing the most effective online marketing programs on the Internet today. Entrants benefit from assessment of their marketing efforts by a professional judging panel and the marketing opportunities presented by being recognized as an award-winning web developer.